They contain detergents that strip away natural oils, leaving our skin dry and vulnerable. In fact, they are often the cause of extra dry skin. And you cannot rely on manufacturers to let you know about them. For example, the most popular cream for eczema contains a detergent that weakens the skin and causes irritation. All true soaps are made by combining fats with a strong alkaline base. Soaps can be adjusted for their cleansing power (think “harshness,” too), their hardness and durability, their scent, their lathering qualities – and their ability to moisturize. You cannot get all of these qualities in one soap. For dry skin, gentle, moisturizing qualities are the most important. There is no need for synthetic chemicals in soap – with the exception of sodium hydroxide. That is the strong alkaline base that is used to turn oils (fats) into soap. None remains once the soap is made. Any other synthetic chemicals are surplus to requirements! It just depends what the soap-maker is trying to achieve. Some people do not like rich, creamy soaps. They may have too much oil on their face already. And richer soap does not last as long as harder soap. It can cost more, too. The soap I make is “super-fatted” with moisturizers and emollients. 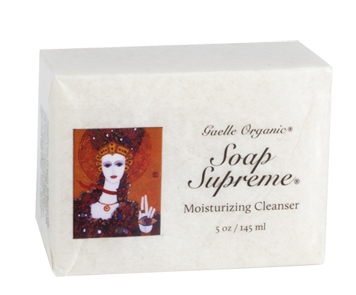 The result is a rich, creamy soap that is ideal for dry skin. Fragrances can contain any number of undisclosed chemicals. You are much better off using cleansers that are scented with essential oils. Essential oils are composed of molecules that are small enough to be absorbed through the skin into the body. Generally, this is very helpful, as most essential oils have strong healing properties. But it is wise to be cautious if you are pregnant or a nursing mother. And some of us are sensitive to specific essential oils. Lavender, for instance, is widely used in soap and people can be sensitive to it. So it is something to be aware of. The trick is to use a gentle cleanser, just once a day, with warm, not hot, water. Used this way, the right cleanser can add moisture to the skin, rather than depleting it.